This photo was almost certainly taken after the last episode of the 6.55 Special on 19 August 1983, outside the front of the building. The 6.55 Special was an entertainment show, which involved live music and celebrity guests. 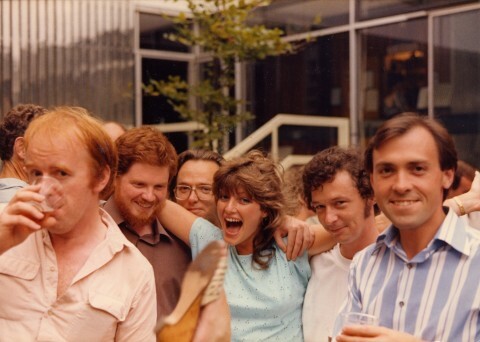 Included left to right are: Chris Glover (moved down south and opened a Chandlery shop); Leigh Sinclair, VT editor (2nd from left); John Burkill, VT engineer; Elaine Baldwin; Ivor Williams, VT editor; Paul Wheeldon, Communications Supervisor. It was Elaine Baldwin’s last day at Pebble Mill before leaving and working at Central. Thanks to Jane Mclean, Ann Gumbley-Williams and Steve Dellow for identifying everyone!